Save your back and protect your rail siding. The ultimate in ergonomic sign holder design. Step down on the pedal and the spring-action holder falls below top of rails. To raise the sign holder, step down on the roll pin and the holder rises up to vertical so you can lock it into position. 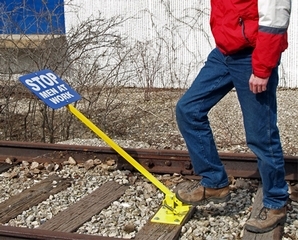 Sign holder base can be screwed to tie or bolted to concrete alongside track. Lag screws provided. Powder coat yellow finish for long life. Weight 12 lbs. Can be padlocked in up and down positions. Lock not included.